Reshaping a data from long to wide in python pandas is done with pivot() function. Pivot() function in pandas is one of the efficient function to transform the data from long to wide format. pivot() Function in python pandas depicted with an example. We will reshape the above data frame from long to wide format in R. The above data frame is already in long format. Pivot function() reshapes the data from long to wide in Pandas python. 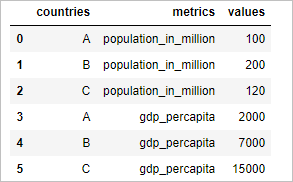 Countries column is used on index. Values of Metrics column is used as column names and values of value column is used as its value.